Ok, so I know it’s August and I’m perhaps a little bit late to the game with this, but I was just thinking over the last few days about how much I enjoy reading during summer. The warmer weather (depending on where you live!) and longer days make it seem like there are more hours for reading and give us all a more pleasant setting in which to do so. I know everyone’s reading styles are different and I’m a huge advocate of doing things in a way that suits you and enables you to get the most out of reading, but I thought it would be fun to put together a few ideas about how you can (potentially) enhance your summer reading. As I say, these are by no means proclamations on how you should read, just a few fun ideas you might can to try while summer is still here. Ok it’s confession time. I have a serious love for parks. And I mean a love. I will walk through a park in bright sunshine or grey cloud. It could be pouring with rain, but if you invite me to the park, there is an excellent chance I’ll still come. Despite claiming that I’ll go to the park in any weather, I enjoy going most during summer. And perhaps my favourite thing to do in parks (other than play on swings and roundabouts that were clearly meant for children) is to read. Reading in a park on a warm day is just about one of the most relaxing ways to enjoy a book if you enjoy being outdoors. If you can find a quiet corner, my advice would be take a rug, a cold drink and some fruity snacks and let a few blissful hours pass you by. A lot of people often talk about reading ‘summer books’ during the summer months, which is what I’d call reading in-season novels. These are the kind of novels that are set during the summer months and involve holidays or adventures that you expect to have when it’s warm (think Second Chance Summer, Wanderlost, Us and Love & Gelato). Reading these books during the time of year when they’re set can create a truly immersive experience; when the internal setting of the book matches the external (warm, sunny, full of ice cream) we can feel heightened concordance with the characters and events, and perhaps even more empathy overall. While reading in-season books can make you feel more in tune with what’s happening in the story, I find that reading out-of-season novels can amplify the elements of difference. Reading a book with a winter setting (Snow Like Ashes immediately comes to mind) during a hot, sunny day, is likely to throw into stark contrast all the cold, dark, snowy imagery that the book has to offer and consequently make it seem more intense. I don’t tend to match my books to the season, so I’ve definitely found this to be the case in the past when reading a summery book during winter. If you’re lucky enough to live somewhere where summer is consistently hot (haha not the UK) then you have the good fortune of being able to enjoy cool beverages and snacks while reading your latest book. Not that those of us with abysmal climates can’t enjoy them, it’s just not quite the same eating an ice cream and reading while sitting in the pouring rain as it is in blistering sunshine. (Disclaimer: I’m horrendously biased and these are my fave summer snacks). I know this one is pretty much a given for all bookworms over the summer, but reading while you’re on holiday – be it in a different city or an entirely different country – can be a great way to appreciate a book from a new vantage point. 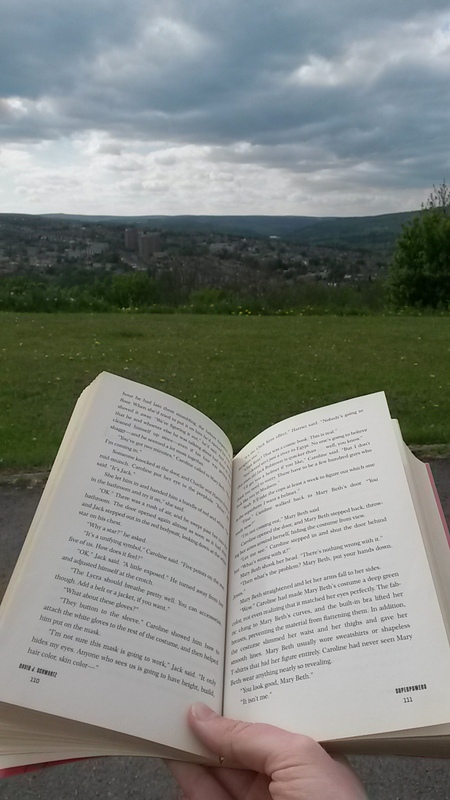 For some readers, the setting in which they read doesn’t matter. Others have their cosy nooks or favourite cafes in which they like to hang out with a book. But having a complete change of setting, i.e getting out of your city/country, can give a unique experience when reading, depending on the type of book. With a fantasy novel, for example, you may find you have the same experience whether you read it at home or in Austria (if Austria is your home, insert random country here). But if you’re reading a novel set in Peru, while on holiday in Peru, then you’re likely going to get more out of the book by being able to walk the same streets as the characters and gather insight into local culture. Authors aim to transport us to other places in their books, but if we also happen to be in those places while reading them, imaginably, the effect will be something quite special. As a final note, reading while on holiday is a killer way to destroy your TBR. Which is always fun. So these are just five ideas of how to to get a little more out of your summer reading while the nights are still long. If you take one thing out of this post, it should definitely be to get some banging snacks for when you’re reading. Snacks are great.